Killer: "Robert, don't you care about me? I know you care about me, I could see it"
Detective Bobby Goren: "I didn't mean for you to see it"
When studying for a college class sometimes the materials springboard the student into a new way of viewing the same old things, such that it changes their viewpoint on how metadata works in culture. Here is an example of this, how information is a pivot point in a plot of a TV series, to examine the information and the character's human and emotional reaction to it, and subsequent rendering attachment as evidence, with specifics on how personal contact was made using available information, search tools, and relevant artefacts. As a student money is limited, and even paying for information in the "Deep Web" Diana has found from experience may not provide the actual information needed, when by appropriately using the tools at her disposal, may produce the exact results she expects. More limited than money, however, is time, so she must quickly reflect on the process she will use. 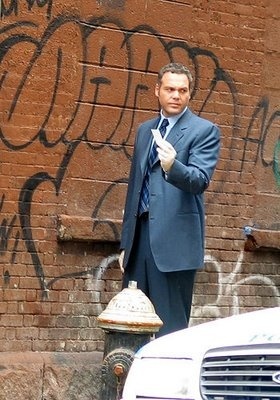 Her quest for information is specific to a specific episode, "Semi-Detached" where the lead character Detective Goren befriends a suspect -- both out of a desire to find out if the female suspect is indeed a murderer, and out of a sense of attraction. How the information he accumulates pivots on his personal weakness and shows just exactly how far he has gone to get both pieces of information, the viewer becomes aware of the change in his view both of the information he has gathered and his intention in a single brilliant exchange. Diana wants to discuss with the show's writer how he came to display this level of insight into both information itself and the show's characters. Being impatient and wishing to complete reading Choo's long text she wants to meet and discuss the L&OCI screenplay with the author by midnight of the same night she viewed the show and read Choo's text. Here are the steps Diana took to acquire the information she needed to find the show's author and contact him, and communicate in the same evening. Because this information may be presented in both brief and complex ways the overview, or simple outline is presented first and the detail specifics with her reasoning are withheld here so as to meet deadline for presenting this information by midnight Friday September 29, 2006. 12. Find Gerry Conway's email address on his blog, under "Go on email me, I dare you"
15. Mr. Conway replies that did not write that section, the actor playing Detective Goren, Vincent D'Onofrio, ad-libbed the sensitive line. "Robert, don't you care about me?" "I know you care about me, I could see it"
"I didn't mean for you to see it"
Man that just works on so many levels. I just started studying for my executive Masters of Science in Information Management at the University of Washington, and I am seeing evidence documents text and information at a whole new level. Oh - anything you want to tell me about your hyper reasoning for the line I'd love to hear it." Oddly enough, the line in question was ad-libbed by the actor on set (though it's consistent with the tone and direction of the script). So I can't take credit for it. Diana's interest in the ways she views the world and the speed with which she can connect changed with both the experience of reading about and using information. This experience was almost magical – it has changed her viewpoint in some depth. The accidental framing of information and emotion becoming evidence, she noted to the story author, was only made possible by his well-written script, this framework became a spring board for the actor to act in response to the immediate events, allowing the story to evolve naturally and bloom with hyper realism. http://en.wikipedia.org/wiki/Gorn As a "Gorn" is a character that any Star Trek Science Fiction fan would recognize, Diana was not concerned about spelling the Detective's name Goren correctly because Mr. Conway has written science fiction for years and it would only add a layer of interest to the email. One metadata about which we have not thought out the full implications yet, is that of the huge bonfire in Nazi Germany in 1932 on which thousands of classical books were thown. That was before they started thrown people on it... Nowadays we do not burn books or people any longer. We simply let them gather dust in our libraries and prefer the super fast google dictionaries which give us in two seconds what may have taken twenty years of laborious research and hard work of writing. Indeed, what is at the cutting edge of technology may be change, very fast change, but whether or not it is for the better, for the enhancing of our humanity, that's another story. P.S. Before the self-appointed guardian of political correctness and censor in residence of selected grammatical purity consults his dictionary and points out the errata above, the second sentence ought to read "That was before they started throwing people on it..."
still Clancy - ""Countries that do not control knowledge and information tend to do better because the average guy who is exposed to a lot of information can get ideas and profit from them." Tom Clancy"
Intriguing indeed,Linda. You must surely have seen today's article on DNA conceived as mankind's library (which indeed it is as Jung pointed out too with his concept of the collective unconscious...)and with the potential of manipulating it so that every human being is born with a genome that contains all the books ever written. It appears that the article was greeted with a yawn judging from the comments that followed. As you say, burning by ignoring? In any case, as somebody who is up on the latest in technological innovations, I'd be interested in your take on such a proposal especially on what would happen to human freedom if actually put into effect. Would an atheist consent to have in his genome structure the Holy Bible against which he has been grinding an axe all his life? Or would he simply be a carrier of books which he never bother to read? Would he burn all those carrying such awful book? How is that different from the Inquisition of old? Or was Dostoyovsky on to something when he said that "place a man in a wholly deterministic universe and he will blow it up simply to prove that he is free."